Don’t let a tiny bit of snow fool you – it’s not too late to landscape! You did it – you survived the dog days of summer and got the kids back into the school routine successfully. Good for you! But as you sit back in your favourite Adirondack chair sippin’ on some much-deserved bubbly and rejoicing in your awesomeness, you see it: you’re once lush summer retreat is suffering from *gasp* – yard neglect. Don’t panic, it’s not too late! There’s still time to get your yard ready for winter and ensure you avoid the looming mess come this spring. Now’s the time to break out those gardening gloves and dig back into your flower beds. Till your whole veggie garden and remove old plants and debris. Reveling in the success of your perennials? Divide those babies up and get them into spots and pots that didn’t fare so well this season and you’ll be sitting pretty come springtime. ‘Tis the season to trim, prune, and train your branches. Cut back any trees, bushes, and shrubs who have overgrown their welcome. As the leaves change and fall and start to cover your yard and flower beds in autumn hue goodness, clear that foliage! Leaves and weed buildup create the perfect cozy home for pests and disease during the winter months, which can suffocate your grass, so, get your rake on! Bonus tip: mulch up those leaves and add them back into your flower beds to add delicious nutrients! Some shrubs and small trees can be sensitive to the cold and need a bit of protection. In the crisp and cool Alberta climate, prevent damage to your plants by wrapping the base in plastic, cloth, and/or burlap. Treat your lawn to a great send-off into the cold of winter and give it one last mow. This will ensure your soil dries more quickly when all the white stuff melts away this spring. Finish it off by adding a fall fertilizer to ensure it has the nutrients it needs to survive the dropping temperatures. 6. Don’t believe me? Ask the Gutters! Clean those gutters out! This is an important step that often gets overlooked when preparing your lawn for winter. Get rid of leaves, debris, and anything else that can clog up your gutters and prevent proper drainage. Go a step farther and rise them out with a hose – you’ll be happy you did! Roots need love too! The drastically changing temperatures during the winter can cause water to pool and damage your precious plant and shrub roots. Aerating the soil will keep your roots in tip top shape and get the proper nutrients down into the ground. Take the time to give your tools some TLC. Properly clean and store all your gardening tools in a clean, dry space, like your shed or garage. Avoid damage to your hoses, water features, and irrigation system and completely drain and dry of all water. Winter can wreak havoc on even the most durable decks. Keep mold and mildew at bay and give your deck a good wash with a pressure washer or deck-cleaning hose attachment. Prevent moisture damage by applying a weatherproofing stain. Big dreams for your yard in 2019? 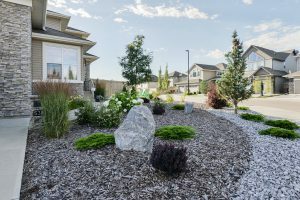 Fall is the perfect time to avoid the mess that spring can bring and it’s also the time to book your landscape consultation with experts who will help you with your new yard design. Remember to book your installation before the snow flies; you’ll be relaxing in your dream yard come spring 2019! Looking forward and winterizing your yard for the upcoming cold season will set you up for success and greater convenience when spring rolls around. For more tips to ensure you and your yard sail smoothly through Canada’s various seasons, be sure to check out our website periodically and feel free to contact us with any queries. Book a design consult today.